The amazing season for area teams continued on Friday. While Bishop Amat, Glendora and St. Francis all saw their seasons end, the group mentioned above press on and now have a chance to make history. And the matchups couldn’t be more glorious! Championship: Sierra Canyon at San Dimas, Friday. What a Round 2 for the SGV(N)! What can you say? This was supposed to be one of the best years in SGV history and the playoffs are proving it. Bishop Amat is into the semis in the Pac-5. There’s dream matchups between locals like La Serna-St. Francis and Charter Oak-Glendora. There was a huge upset by San Dimas. 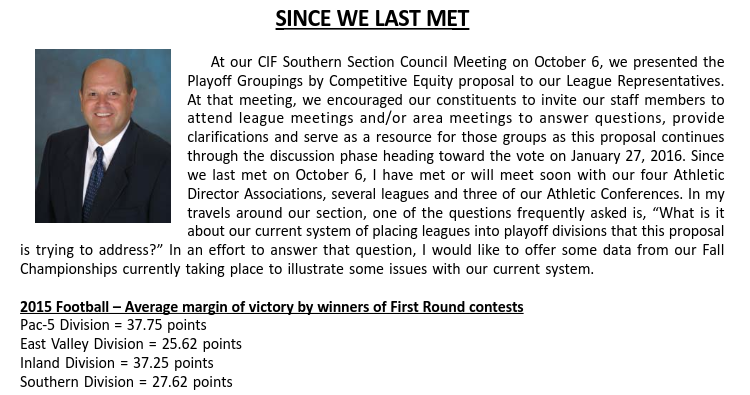 San Marino finally broke through the second round and did so in the Central Division. It’s all gravy now for the Titans. What this data clearly indicates is that there is a very large gap, across the spectrum of sports and divisions, in the competitive levels of teams that enter our playoffs under the current system. By placing an entire league into a particular division, we see that it creates numerous scenarios where every team from that particular league does not belong in that particular division and the results of that situation are difficult for everyone involved: the winning team, the losing team and those who are there to watch it happen.